Is there any such beast? I always thought they were merely Kewl in the same way as "Ninja Jesus Wolverine!" is kewl. Of course I may be a little prejudiced by my fondness for the Warhammer World. . . Both breeds of dark elves have their merits. 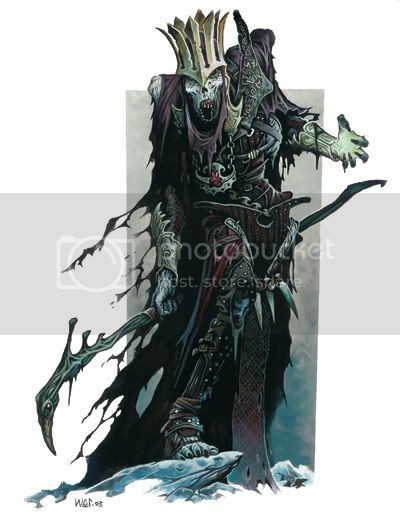 The drow are fun for a subterrainean enemy with lots of spiders. The WH Dark Elves are fun for being mass-murdering zealots. Either way, an adventurer knows they are making the world a better place by stopping their efforts. As for Drow, I prefer the way they are represented in the webcomic Drowtales. 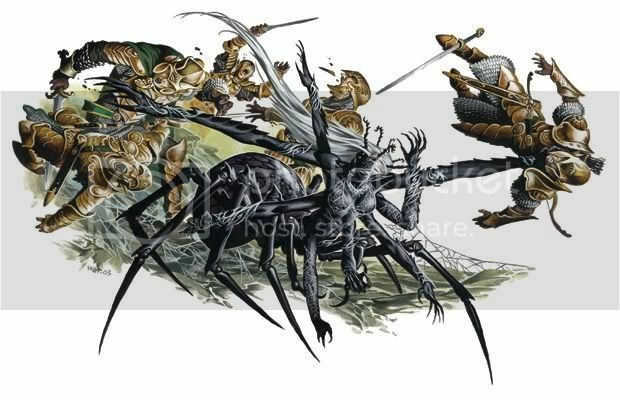 In the Flintlock Fantasy game my roommate is currently running, his dark elves (who look like drow) are the Azrec of his world; created by an ancient race of intelligent spiders who sought to be worshipped as gods. Libra wrote: Is there any such beast? I always thought they were merely Kewl in the same way as "Ninja Jesus Wolverine!" is kewl. A have to agree in loving the Warhammer World. I have been going through a lot of my original builds and have been making some edits. On many of my beginning builds, I would generalize their spell-like abilities. With these edits, I have been trying to give the creatures their proper abilities and make sure their spell-powers are correct in how they work. As such, some builds are cheaper, while others have gotten more expensive. You may want to see if anything you like has been changed. Do be aware that I am still making alterations, and will be continuing for the next week or so (time permitting). Ah well, a-trawling through the archives we go then. 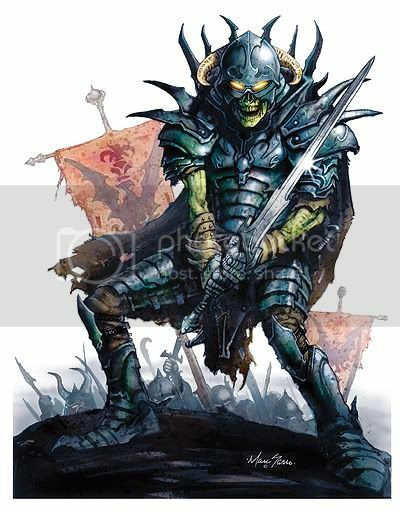 The above Death Knight was based on a "9th-level Paladin". Libra wrote: Excellent work Prodigious Duck! I agree about Wayne Reynolds. He is one of the greats of this gaming-art generation. I got to meet him at GenCon a couple of months ago, and he was a pretty cool guy. I just wish he would put out an art book, rather than the tiny sketchbooks he had available at the con. I wish I could steal his talent so I could use it to illustrate my favourite moments from many, many sagas. Or, failing that, keep him and a group of my favourite artists locked up and producing the art I tell them to! There you are, sitting at home, reading a book, or typing on the computer... Suddenly, a giant monstrous spider just appears in your room, from thin air, grabs you, and takes you back across the dimensional barrier to its lair in the Ethereal to eat you at its leasure. It would be like you just vanished from existence! That would be a great and terrifying mystery for a fantasy rpg game. The original Lolth build can be found here.